Hi FDC cheese share-holder. You likely read about the cheese share online when you first chose to join, but that may have been months ago. This is a reminder about how it works. On a “cheese week”, the cheese will be in a cooler at your depot. It will come *approximately* every other week, beginning this week, June 9th. Sometimes there will be one cheese per share, sometimes two. Occasionally there is a choice of flavor or variety. Look for instructions on what to take. This could be announced on the sign out sheet, taped to the top or inside of the cooler, written on the welcome board or all three. We don’t want you to miss out, nor to take too much. Our official policy is we do not hold shares from one week to another. We can hold products like honey and jam easily, but not produce. The coordinators often bring cheese back for the following week, and then donate it. This is not our policy, but we are nice and try our best to connect you with your shares. If you request a delivery on a cheese week, it is best if you leave out a large cooler to receive your share. Some of our cheeses are pasteurized (chevre, mozzarella, burrata), but many are made with raw milk – gouda, cheddar, tomme, blue. Typically, over half of the cheese share is make with raw milk. These are aged 60 days or more for safety. The whole season has not yet been fully planned, so the above list is not necessarily the order of things. If you are uncomfortable with eating aged, raw cheeses, we can remove you from the cheese share. If you despise, or just don’t prefer, smoked cheese, reply to this email and I will put you on the “non-smoker” list (please send a fresh email even if you have been on the no-smoked-cheese list for years). We often order a smoked and non-smoked version of fresh mozzarella in August, and occasionally other cheeses like a smoked gouda. It is easy enough to increase the number of plain. 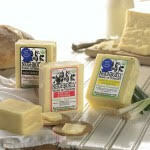 We would love suggestions from you if you run into a great local cheese. We try to find a balance between styles, flavors, and types of milk. We have to keep them affordable. But sometimes dairies are willing to give us a price break since we place large orders. This entry was posted in Cheese and tagged cheese, cheese share, rennet, smoked, vegetarian by Jennifer Moore. Bookmark the permalink.